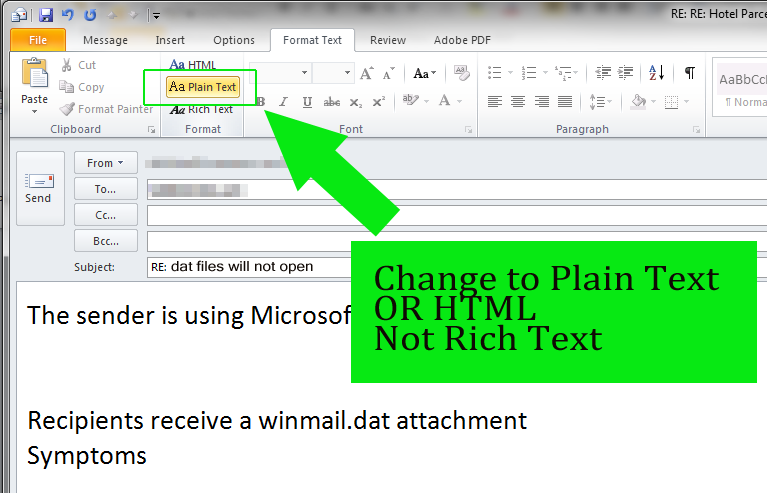 When someone sends an attachment using “Rich Text” formatting in Microsoft Outlook the inserted attachments become .dat file which can only be opened if the recipient is also using Outlook and sometimes only if they are in an Exchange environment. The sender is using Microsoft Outlook. Sender is using the Rich Text message format, which the recipient’s e-mail program cannot interpret correctly. 1. On the Tools menu, click Options, and then click Mail Format. 2. Under Message Format, in the Compose in this message format list, click HTML or Plain Text.